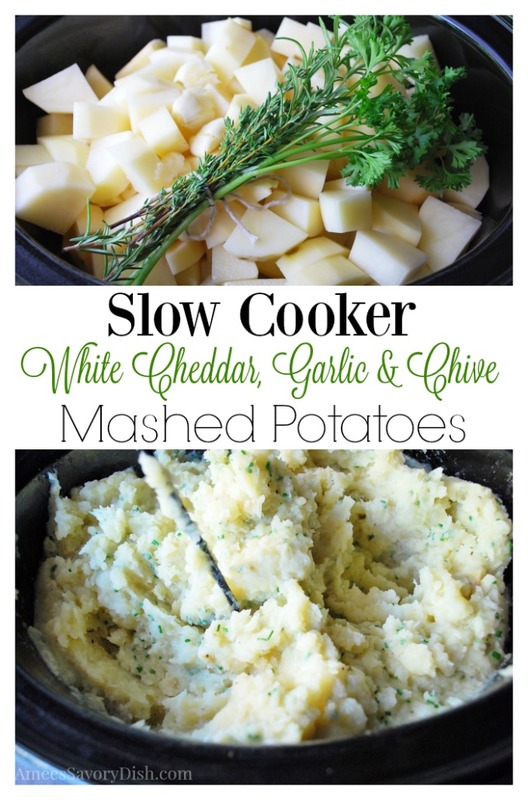 *This Slow Cooker White Cheddar, Garlic & Chive Mashed Potatoes recipe post is sponsored by Idaho Potatoes and Country Crock. All opinions are my own. 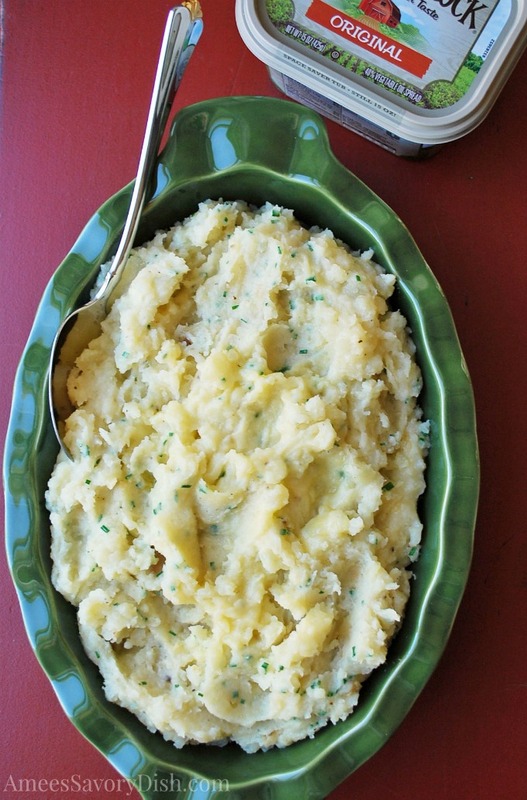 If you’ve never made mashed potatoes in the slow cooker, you have to try it! It’s such a simple method and the results are just as good as the original stovetop method. Not to mention, making them in a slow cooker will save you precious time and stove space this holiday season. After adding the peeled and chopped potatoes to the slow cooker, I tied a bundle of fresh herbs with kitchen twine and placed them on top. You’ll be surprised how much this infuses flavor into your potatoes, without being overpowering. When the potatoes are done cooking, just remove the bundle and discard. These slow cooker White Cheddar, Garlic & Chive Mashed Potatoes will be the hit of your holiday table! Spray a slow cooker with olive oil cooking spray. Wash, peel and chop potatoes into cubes and place into the slow cooker. Add chicken broth and smashed garlic, then place the herb bundle on top of the potatoes. Cook 3 ½ hours on high, switching to warm setting when cook time is done. Heat milk, cheese and country crock spread in a pot over medium-low heat until smooth and melted, stirring often. Season with salt and pepper and add chives. Pour mixture over the potatoes and use a potato masher or hand-held blender to whip potatoes (use a masher if you like a chunkier texture). If needed, add a little more milk until desired consistency is achieved.